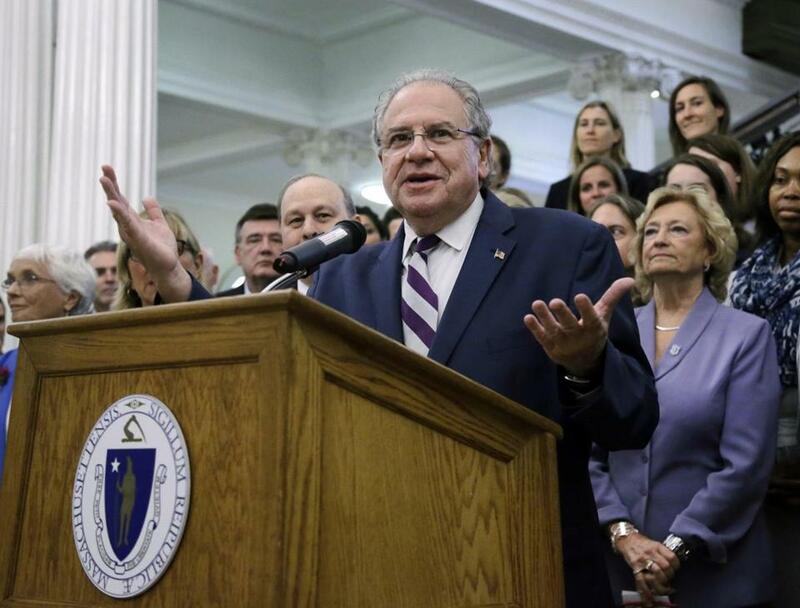 Last year DeLeo asked local business leaders to find ways to increase access and improve the quality of the state’s early childhood education system, which serves children from birth to 5 years old. His presentation Wednesday marked the release of that report. The average annual cost of full-day child care is $17,000 for infants and $13,000 for 4-year-olds, some of the most expensive rates in the nation, according to the business leaders’ report. There are about 90,000 early childhood teachers in the state, who earn a median annual salary of around $25,000 — just $700 above the federal poverty level for a family of four. Many workers are women, particularly women of color, and the annual turnover rate is around 30 percent, according to the report. Many classrooms go unfilled because of a lack of qualified teachers, the report also found. The speaker told the small crowd gathered in a State House chamber that, based on the findings, he will advocate this year for more funding for early childhood education programs in the state budget. He said he would also file legislation to improve professional development for early childhood workers. DeLeo’s presentation did not include specifics on how much money he would devote to these programs or where those funds would come from. The revenue source issue has plagued many local officials who have struggled to secure funding for their early education initiatives. Last month Mayor Martin J. Walsh renewed a push in his state of the city address to expand access to high-quality pre-kindergarten. Walsh has pushed similar initiatives since he ran for mayor in 2013. In his latest effort, Walsh proposed using tourism tax revenue raised in Boston from the Convention Center Fund to increase access to pre-kindergarten. Walsh has estimated that revenue could bring in as much as $16.5 million annually. Democrat Jay Gonzalez, who is running to challenge Governor Charlie Baker in 2018, has proposed to fund early education through a tax on income over $1 million. Gonzalez was a member of DeLeo’s business committee that produced the report. DeLeo said he has spoken with Walsh about the mayor’s idea, but the speaker did not endorse it — only saying it would be part of the discussion. The mayor’s proposal would only expand access to pre-kindergarten, not education for younger children. Representative Antonio Cabral, a New Bedford Democrat, has filed a bill that would also use the convention center fund to expand universal pre-kindergarten throughout the whole state, not just in Boston. So far, Governor Charlie Baker has not indicated which of these proposals, if any, he could support. Walsh’s plan would require a change in state law, and when asked about that idea last month, the governor was noncommittal. Questioned Wednesday about the speaker’s plans, Baker said through a spokesman that he supports improved training for educators. Baker’s budget proposal for next year includes a $7 million increase for early childhood education centers, plus additional money to increase pay for unionized child-care providers. The budget also includes $1 million to improve the state’s information technology infrastructure — a proposal that coincides with the business committee’s recommendations, according to a statement from Baker that was provided by spokesman Brendan Moss. But advocates say the state would need far more than that to make real improvements to the state system. There are about 10,000 state-licensed early child-care centers in the state, and they have the capacity to serve more than 240,000 children, according to the report from DeLeo. About 58,000 children from low-income and at-risk families receive taxpayer subsidies to attend such programs, and another 15,000 are on a waiting list. Business leaders at the event Wednesday said they consider early education vital to producing the college-educated workforce needed for the future. High-quality pre-kindergarten increases the likelihood that a student will graduate high school by 31 percent, attend college by more than 80 percent, and secure employment by 23 percent, the report said. The report estimated that an investment of $16,000 to $18,000 per child annually in early years returns a total public benefit of $700,000 to $800,000 over the lifespan of that child. “It’s a workforce development issue, and it’s a business imperative,” said Jim Rooney, chief executive of the Greater Boston Chamber of Commerce. Wayne Ysaguirre, chief executive of the Nurtury early childhood education center, explained how difficult it is to retain good staff at his new facility in Jamaica Plain. His center receives assistance from the state to employ some of its workers at a pre-set pay. One teacher, he said, worked four months before leaving for a job with Cambridge public schools because she couldn’t afford to pay her Boston University student loans on a $25,000 salary. Ysaguirre said more funding would not only improve teacher retention but also improve the curriculum and services they can offer children. “This is the first time in a long time that I am hopeful,” he said.